The Damianita or Crysactinia Mexicana is a low mounding, flowering, evergreen shrub. It grows to 12″ tall by 2′ wide and blooms late April through September in Arizona. The Damianita had needle-like, resinous, aromatic leaves and the flowers on daisy-like, yellow about 1″ in diameter and they are also fragrant. The Damianita is native to W. Texas and Northern Mexico and is usually found on south facing, rocky slopes. It is Hardy to 0°F, takes full sun or light shade and can handle reflected sun. 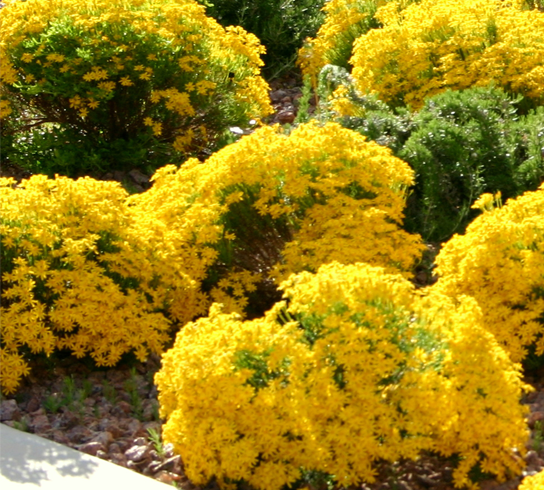 The Damianita is drought tolerant but may need supplement once or twice in the extreme heat of the Arizona summer. It prefers good drainage and requires little maintenance. You may want to cut it back in the cold. This plant provides color with a long bloom period in Arizona. It is great lining walkways, borders, or as an accent in a cactus garden and is rabbit resistant.